Team Canada teammates Ina Forrest and Sonja Gaudet were co-winners of the North Okanagan Athlete Of The Year Award in Vernon sponsored by Dan and Jamie Currie of Tim Hortons. “The (award) committee took a long time to make their decisions. 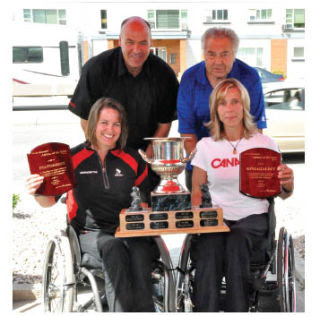 The choices were not easy," chair Mel Briggeman told the Vernon Morning Star, "but in the end we went with the best front-end curlers in the world." Forrest, a mother of three who lives and runs a business in Armstrong, said she appreciated getting some exposure at home. "It's very nice recognition from our community," she said following the outdoor ceremony at Tim Hortons on Highway 97. "We don't often play in our own community on our national team so it's nice to be recognized in your community for accomplishments away from your community." Gaudet, who won the award last year, echoed that sentiment. "No, it doesn't get old, but you appreciate the support and being noticed by your community. It's just as special (as last year) definitely. Ina and I are great teammates and we bring the best out in each other so I'm happy that we got this award together."